Mark Ryan Chariker is a printmaker and oil painter. His paintings are rich with depth and tone, primarily depicting monochromatic fantasy-scape landscapes that reference French rococo paintings, the Hudson River School, and 19th century landscape painting. Chariker has recently delved into printmaking, working with monotypes, etchings, and aquatints. His prints are richly narrative in a mysterious, humorous, and fantastic way. In a deftly skilled manner, Chariker manages to confuse time and place, and to also balance the grotesque, the beautiful, and the ridiculous in such a way that allows the piece to continuously transform and reveal itself to the viewer. Mark Chariker earned his BFA from the School of the Museum of Fine Arts/Tufts University. He was an artist in residence at the Roswell Artist In Residence program in Roswell, NM (2006-07), at SÍM Residency in Reykjavik, Iceland (2011), and at the NES Residency in Skagaströnd, Iceland (2011). He has shown in group and solo exhibitions across the United States and in Iceland, and he currently lives and works in Brooklyn, NY. What is your background in art and how did you enter into your own particular practice? I think it all started in art school as I wasn’t doing much art before then. I went to the Museum School in Boston, MA and I kind of went wild for a year and a half before I actually realized that I wanted to take this seriously. So when that happened I starting working all the time on painting and basically lived at the school. And I really felt like I flourished there. I had some great teachers, too. Right after I graduated I started being represented by this gallery in the city. At the time it was exciting, but it ended up being one of the worst things to happen to me as an artist. The work I was making at the time was very different from what I make now. I was making these huge 8 feet tall abstract paintings that were very detailed and time intensive. They were kind of ridiculous and over the top when I think about them today, but at the time I was really inspired. After school I ended up going to this residency in Roswell, NM called the Gift of Time residency, where you get a house, studio and monthly stipend and can make whatever you want. I was living in the middle of nowhere and spending a lot of time alone. Without the structure that people provided, the art scene in Boston and the bubble of art school I started asking myself some tough questions about myself and my work. While this introspection is going on I was also putting work together for the gallery and I would get requests from them to make X number of paintings, and I just felt that it was a really weird way to make art. It started to just feel hollow. By the time my residency was over I didn’t want to make any paintings. This was during the 2007 art bubble where everything was overselling and overpriced. It was a strange time for a lot of artists. I remember paintings selling for 8 times what I had previously seen. It was really dumb. On top of all of this I also wasn’t seeing any money for the works of mine that sold. The gallery I was with was beyond corrupt and by the time everyone realized it the owner had left the country. So I was owed all this money for 2 years worth of soul sucking paintings and ended up never seeing more that a small fraction of what I was owed. By the time the residency was over, and the gallery fell apart a whole slew of personal things happened all at once. I end up moving back to my home state of Kentucky feeling pretty low and I ended up just quitting art. So I started up this new life and didnt really talk about art or mention that I was a painter to anyone. I got into building old 70’s mopeds and worked as a t-shirt screenprinter for a small shop. Those were some pretty rough years, and I think i reached a low point that forced me to realize the importance of art in my life. I remember I opened up an art history book or something during that time and there was something about these older paintings that was not only interesting but they started affecting me on a deep level. I don’t really know why or what, but I remember thinking that if I had to make art, there was something in these older works that I had to tap into. That was my starting point. That slowly simmered in the back of my mind for a couple years until I started applying to art residencies and then got into two of them back to back in Iceland. I went to Iceland for a couple months and for the first time in years started to enjoy making art again. The work wasn’t good but I didn’t care. I felt like I was becoming human again. Instead of buying a return ticket to Kentucky, I got a ticket to NYC where my brother was living and encouraged me to stay with him for a month. After a couple weeks I found a great job working for an artist and decided to stay. And in that time I started teaching myself how to paint all over again. Were you always working in oil, or was there also a material shift in your practice? How did printmaking enter in? My earlier paintings were acrylic and when I quit I really didn’t want to work with them ever again. When I started back into art, it was a very gradual, painfully slow transition into oil. I went through four years in art school and never learned how to paint in oil or render the figure. It was all theory. So, I have had a lot of learning to do. I’m focusing on printmaking right now for two reasons, I genuinely love the process and because I think I can realistically turn it into a supplemental income. The sooner I can quit my job to make art full time the happier I’ll be. I’m kind of critical of how I use color right now. I think that I use color really poorly or at least one dimensionally, so I’m restructuring my approach. Now I’m practicing with a five or six color classical palette, but I’m trying to push that as far as I can. My painting is in a weird place because I’m taking it all apart and starting over completely, so I’m not sure where it’s going to go. The black and white printmaking is simpler. Working without color forces you to just focus on value shifts. How do you approach the subjects and imagery in your works? How are you thinking about narrative? I think I have two paths going on right now in my work, and I’m trying to figure out some way to bring them together. There are the landscapes that I make, which are these kind of fantasy-scapes. They are places where I don’t have to overthink anything and can just feel my way through them, so they’re simple in that way. And then I have my figurative works, which are really new. A lot of these narratives surprise me. They are coming from a very intuitive place. I don’t try to have a clear cut idea, instead I’m feeling my way through the work and trying not to overthink it. I’m enjoying this way of working, and I’m enjoying being surprised. I think back on my time suffering while making my past work, the detailed over-thought abstract paintings and I use that as a guide for what not to do. How do you develop a scene or an image? Well I draw everyday and constantly sketch. These sketches get my imagination going, like stretches before an exercise. When I start working on a scene it unfolds like a puzzle. Usually I start with a figure and then ask, who is this person? What are they doing? If they kind of look like they’re doing this one thing, then I’ll draw that out. Is there somebody with them? If so then I can start thinking about their relationship and story. And then I continue on with the narrative and it’s exciting to draw like that because it is interesting and stimulating the whole way through the creative process. Anytime that I’ve tried to draw something that I have clear in my mind, it just ends up being dull or over the top and I’m not happy with it. But when I allow it to happen naturally, it just comes together and has a greater chance of clicking. How did you get interested in printmaking and how do you develop those works? I took a class at the Lower East Side Printshop and I just got really into it. I do monotypes and etchings so they develop similar to how my other work does. Once you get the process under your belt they become just an extension of painting and drawing. Can you talk about how time operates in your works? There’s an ambiguity to specific time and place that I’m curious about. My 7th grade Latin teacher mentioned something once about nonlinear history where figures from the past and future all exist together in some form or another. I don’t know what specifically he was talking about, but I think that idea stuck with me a long time. Besides that my work is at odds with my conflicting love of historical painting and cyberpunk illustration. There are perhaps unintentional iterations of this in my current work, but it is something I want to do more with in the future. Is a lot of your work based from your imagination, or do you source your imagery elsewhere as well? They are pretty spontaneous and from my imagination. I don’t like the idea of using source imagery. I’m no doubt inspired by a lot of classical art and look at a lot of it for guidance on technique, specifically on how to construct space and figuration. Doing old master copies has been vital for my learning. What are you working on right now -- is there a specific focus you have right now? I really want to do a series of etchings that have a connected narrative, like 10 to 15 pieces that work really well together. Goya’s Cappricio’s and Tiepolo’s Scherzi etchings are a huge influence on me in that sense. So I am doing preliminary drawings for a long series of etchings. I’m always thinking about little tweaks that I can do to adjust my structure and be able to make more work. Like having a sketchbook just on my person wherever I go anywhere. If I have a sketchbook just in my pocket at all times, I get a drawing done. I try to not be on my phone a lot, like I’ll only use my phone for music or podcasts while I work and then that’s it. Having a well organized space, one that functions well for my unique quirks is key. When I come home tired from a long day of work, I need it to be as convenient as possible to start working on art. Also, coffee and lots of water are really important too. Do you work on things usually in one sitting? There’s this story that I read about where there’s this teacher who had this pottery class and she divided her class into two groups. One group of students were told to make the best single pot, and that would determine their grade. They had the whole semester to do it and they just had to make this one really good thing. The second group of students were told that they would be graded on how many pots they could make in a semester. In the end, the students that made the 50 or 60 pots ended up making better work because they were going through ideas quicker, making mistakes and learning from them. I really like that idea, and I think about it a lot in relation to my own practice. It’s also more appealing to me to work that way because there’s so much going on in my head and moving through ideas allows me to learn from them. I make a lot of mistakes but Im learning a lot always. It’s also nice to work quickly and feel like I’ve completed something, especially after coming home and working after an 8 hour shift at work. Eventually, later down the road it will be important for me to spend a significant amount of time on one piece. What do you think makes a work successful? It is hard to quantify a successful piece, but a lot of the time i feel a work is successful to me if I learned something while making it. I feel very behind in my technical abilities so I’m always thinking in that way. In the larger sense, I think a piece is successful when it contains within it something that cannot be put into words. I think this is why most artists struggle with artist statements, as they are antithetical to what they are doing. The best I can do is describe it as a kind of mystery, that you know it when you see it. You are both seduced and confused. I want to do that, even if it takes me my entire life to get to that point. How do you approach scale ? When I was doing large, 8 foot paintings they were just a pain all around. Now that I’m working in my room the size limitation of the space does guide me. Money is also a factor, and saving money is always a thing. But beyond logistical reasons, I like how personal smaller work feels. Some of my favorite works are small and unassuming. I also just question the intentions of a lot of larger works now. Why does art need to be so large? What are you looking at, who is influencing you, what are you consuming ? I’m looking at all the French rococo painters, as well as Goya, and Katsuhiro Otomo’s Akira. The Rococo era I just love, I can’t explain it. Watteau makes me feel human. I feel a strange connection to him. 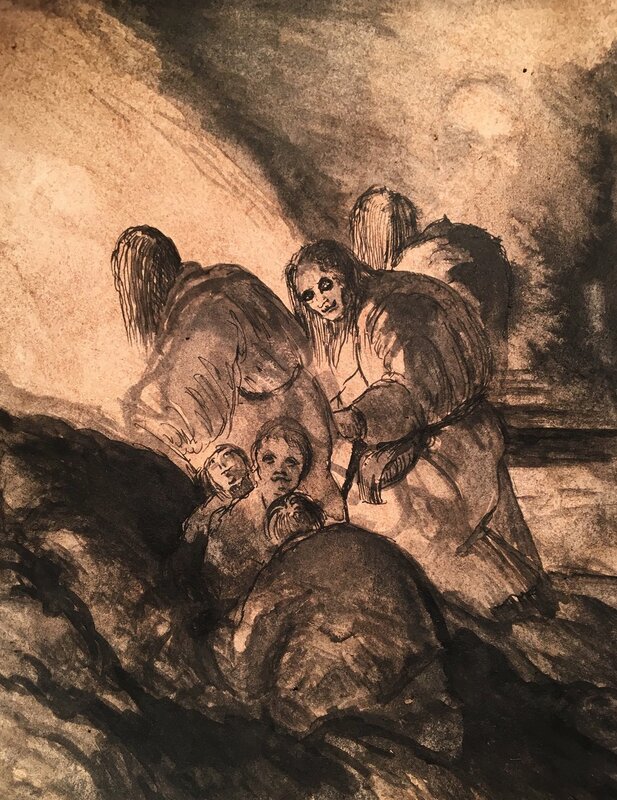 Goya’s line work is incredible and he’s so economical with his marks. A few lines can explain so much information. That’s something I’m trying to do in my own work. I’m also looking at Tiepolo too, he did a series of necromancy etchings that were really influential to me. I'm rereading Otomo’s Akira and thinking a lot about cyberpunk. As far as dry theory text, I like George Bataille and Henri Focillon. My only other really big influence is the music that I listen to specifically Boards of Canada. They have one song that I’ve been listening to for fifteen years called “Seeya Later”, and it has had this continual influence over me. It isn’t a song to me anymore it is something else. The more I listen to it the more it seems like a puzzle I’m trying to unlock. It has been slowly driving me crazy.